Trang Tien Bridge in Hue in Vietnam is the most beautiful bridges in Hue in Vietnam. Trang Tien Bridge in Hue in Vietnam joins north and south of Perfume River in Hue. 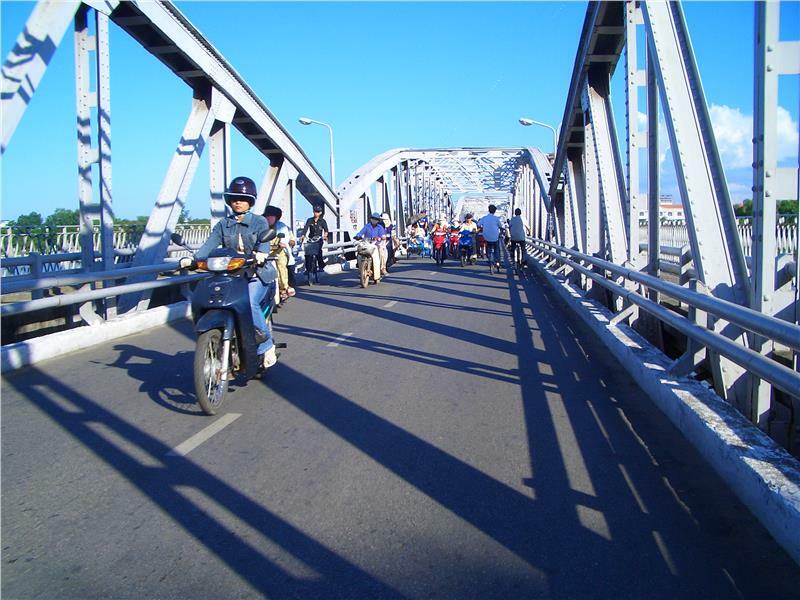 The north side of Trang Tien Bridge in Hue in Vietnam belongs to Phu Hoa District, close to Dong Ba market in Hue. The South of Trang Tien Bridge in Hue in Vietnam belongs to Phu Hoi District, right in the center of Hue city in Vietnam. Connecting 2 riverbanks of Perfume River, Truong Tien Bridge, also known as Trang Tien Bridge was inaugurated in 1899 with its length of 402.60m and 5.40m wide. The bridge was designed in Gothic architecture with new techniques and materials of the West at that time. The bridgehead in the north is situated in Phu Hoa ward, the rest is located in Phu Hoi ward, which is right at Hue city center, Vietnam. Along with Ngu Binh Mountain, Perfume River, Truong Tien Bridge is considered one of the characteristic symbols in Hue. Although Hue Imperial City is home to numerous architectural works ranked the world cultural heritage, Truong Tien Bridge is still the unique and typical image. The bridge retains the gentle soft smooth beauty... like the soul and the gentle, quiet personality of people in Hue, as well as the gentle poetic characteristics Perfume River. 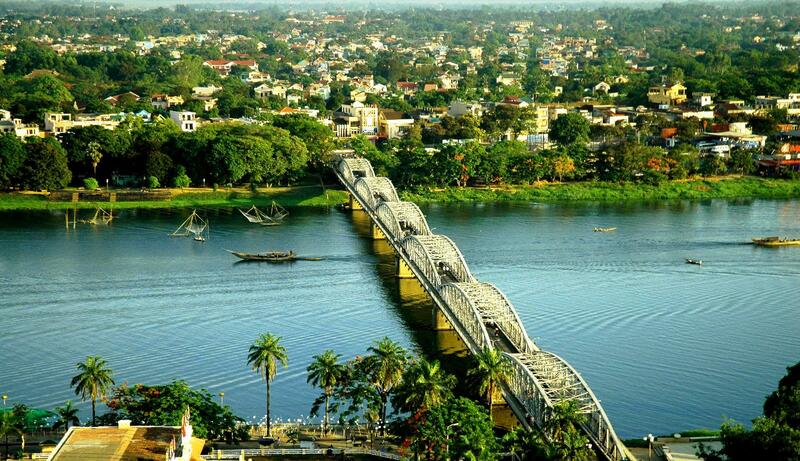 Truong Tien Bridge is worth one of the fascinating tourist attractions in Hue alluring the large number of tourists. Like Long Bien Bridge across Red River in Hanoi, Truong Tien Bridge is one of the first bridges in Hue crossing Perfume River, which is adjacent the citadel. This is also one of the first bridges in Vietnam built in the late nineteenth century and early twentieth century by the French with the steel structure consisting of 6 steel girders. The image of curved spans reflected into the river or into the blue sky, the image of "ao dai" (Vietnamese traditional long dress) of Hue girls on the bridge, the boat on the river under the bridge, the canopy of flamboyant at 2 bridgeheads and the image of the bridge brightly shimmering in the night... are forever beautiful memories, lyrics and romantic language of dreaming Hue. 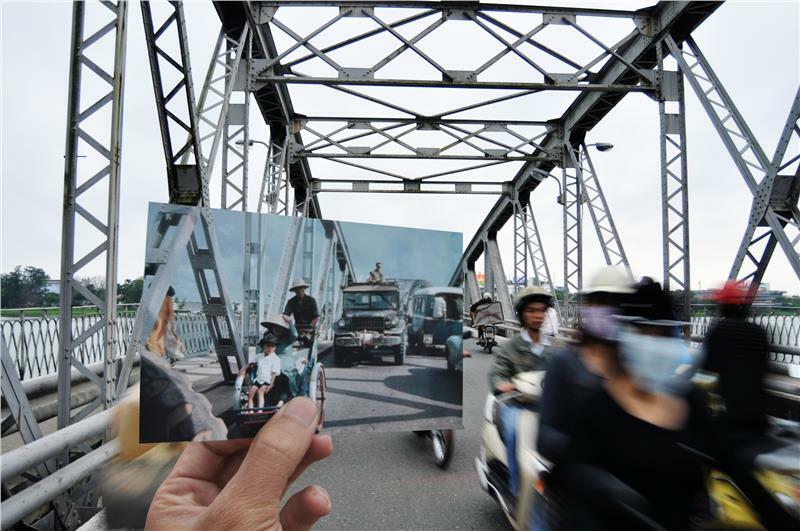 Discovering Truong Tien Bridge is definitely one of the most unforgettable things to do in Hue. Truong Tien Bridge thus becomes one of the indispensable tourist sites in the journey of exploring Hue travel attracting tourists. With the long-lasting history of over 100 years, Truong Tien Bridge has undergone many ups and downs with the development of Hue. When completing its construction, this was a solid steel bridge with civilized structure and construction techniques of the Western. Truong Tien Bridge was the pride of the people in Hue. However, the bridge used to destroy by natural disasters, war and was remodeled several times. Most notable is its restoration in 1991 lasting until 1995. The bridge had many important changes after the restoration. Accordingly, the balconies of the hallway at the location of the piers were removed; the width of the bridge was narrowed (from 6,20m to 5,40m as today); gray is used instead of the original color of the bridge - metallic color; the bronze plaque mounted at the bridgehead with "Trang Tien Bridge" instead of "Truong Tien Bridge" created a lack of consensus on the bridge's name. Thanks to its historical significance, Truong Tien Bridge is worth one of tourist Hue attractions alluring both domestic and international tourists. 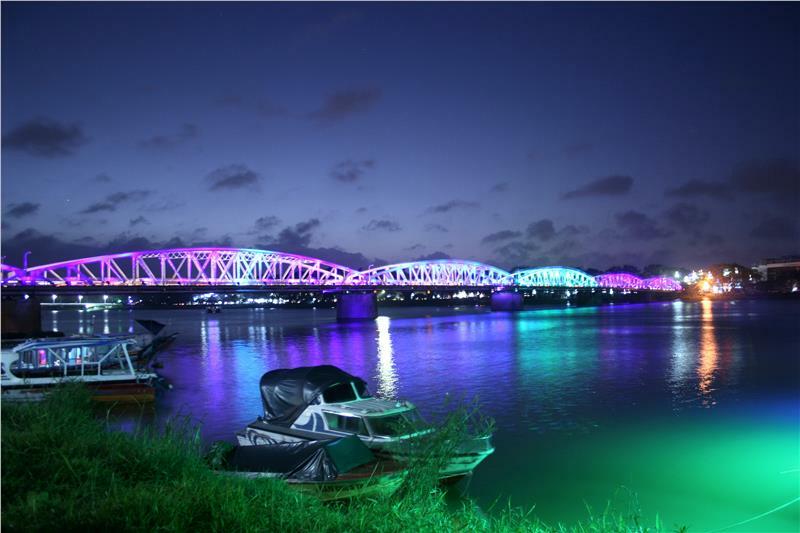 From Hue Festival 2002, Truong Tien Bridge installed the color changing lighting system creating the powerful attraction strongly alluring tourists participating in Hue tours. The night falling down is also the high time for the bridge started brightly and brilliantly in colorful lights. In the traffic planning of Hue city these days, there will be more bridges silhouetted down Perfume River, yet Truong Tien Bridge will probably play an important role in terms of transportation and its historical significance forever. Moreover, the bridge was always a tourism symbol of ancient capital, the hyphen in history from the past to the present and the future. The bridge is worth one of the indispensable symbols when referring the dreaming city. According to numerous city residents and tourists, the best time to admire Truong Tien Bridge is the sunset. The sunshine at the end of the day reflecting Perfume River creates the curious romance. Taking a stroll on the bridge along with the crowded vehicle, tourists will feel the cool breeze blowing from Perfume River. The dragon boats gently floats on the river make the scenery more and more poetic. Standing on Truong Tien Bridge to feel the peaceful river and dreaming Hue will surely be unforgettable experiences. Truong Tien Bridge thus displays its significant contributions in promoting Hue tourism closer to both domestic and international tourists.